Did you know there were 199 house fires during winter in Perth last year? We have 7 actionable winter fire safety tips you can use to ensure your family stays safe. We recommend only using 1 heat producing appliance per power outlet. This includes electric space heaters, no matter how big or small. It’s also a good idea not to use extension cords and power boards for heaters. Make sure your heater is plugged directly into a power outlet as power boards and extension cords can overheat. Make sure surrounding objects are at least 1 metre away from your gas and electric heaters. This includes blinds, curtains, tablecloths, blankets, bed sheets, even dog beds and office supplies such as paper. The same principle applies to fireplaces, make sure you safely remove anything that can burn. We recommend that you do not sleep with your heater on. If you’re using a heater to warm up a room prior to bedtime, ensure you do not leave it unattended. Make sure candles are extinguished before you go to bed. Use a snuffer or a glass dome to protect yourself from burns. Ensure your chimney is free from leaf blockages, structural cracks and loose joints. Inspect your fireplace and chimney once per year, or ask for professional assistance. Also make sure that any ashes are stored in a metal container, and at least 3 metres away from your home and anything that can burn. Make use of a fireplace screen or have a permanent fixture installed, such as a chainmail curtain. House fires most often occur in the cooler months. Test your smoke alarm batteries once a month during Winter. Drying your favourite shirt or jumper on a clothesline will prolong the garment’s life. But winter rains are not always permitting. When using your clothes dryer, make sure you clear the lint filter before each use. Lint is effective tinder when lighting your fireplace and if left uncleared, a lint filter can catch fire very easily. We not only want to ensure your work place is trained and compliant, we want to ensure ever body is aware, safe and doing the simple things to prevent an incident also at their home. 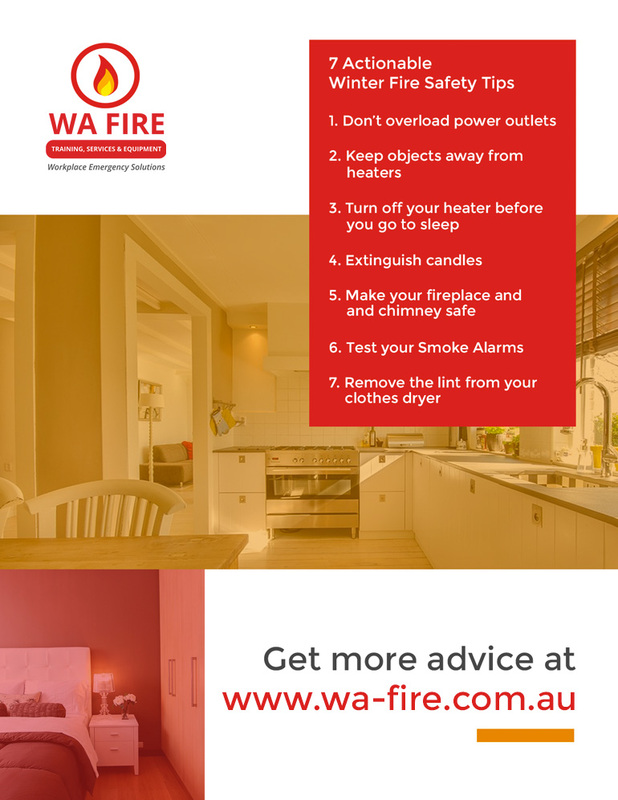 Feel free to contact the team at WA Fire Training, Services Equipment for more winter fire safety tips. Do you know your fire extinguisher types? Maybe you’re asking yourself, “How do I become a fire warden?” Check out our blog or fire safety training service offerings.